Ghana is located in Western Africa, bordering the Gulf of Guinea, between Cote d’Ivoire and Togo. Accra is the capital city of Ghana with a population of about 2,000,000 people. English is the official language of Ghana and is universally used in schools in addition to nine other local languages. There are over 100 ethnic groups living in Ghana. The largest are Akan, Moshi-Dagbani, Ewe, and Ga. The Ashanti tribe of the Akan are the largest tribe and one of the few societies in West Africa where lineage is traced through the mother and maternal ancestors. The most widely spoken local languages are Ga, Dagomba, Akan, and Ewe. Medical Ministry International’s work in Ghana stretches back several decades. 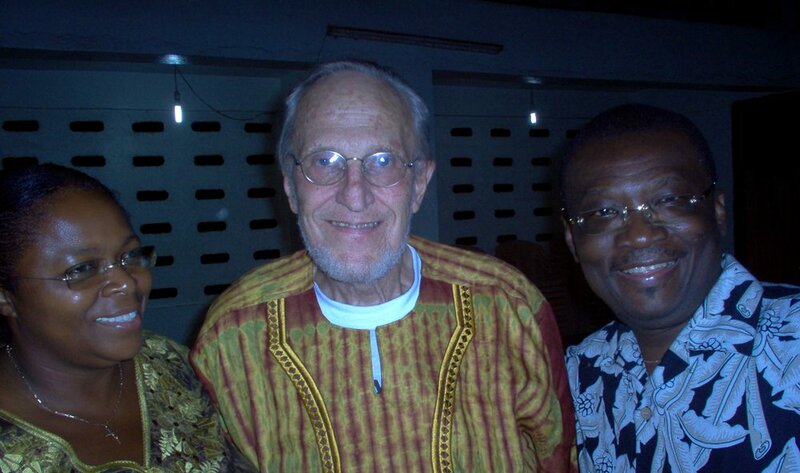 Medical Ministry International has taken teams to Ghana on an annual basis, many under the leadership of Dr. Bob Schoffstall and his wife Peggy, until their retirement in 2006. Medical Ministry International began to support the efforts of Dr. Kofi & Vivian Ghartey and “Sight for Africa” in 2006. Collins Antwi is Medical Ministry International’s Ghana Project Director. He is an electrical/electronic engineer and first participated as a volunteer with an Medical Ministry International eye project in 2006 in his country. He served as a member of the staff of our principle partner in Ghana, “Sight for Africa”. According to Collins who is passionate about integrated health education, "sometimes the solution is to talk to the man (or parents) of the house or share information to reduce child labour, school drop outs, infant malaria mortality, diseases, abuse of women, and so on." Sight for Africa was set up in 2003 with the sole aim of providing eye care services to the poor and vulnerable and the need to avoid preventable blindness. In 2004, Medical Ministry International began to support the efforts of Dr. Kofi & Vivian Ghartey and “Sight for Africa”. Kofi Ghartey, an optician living in Canada for 30 years, returned to his native Ghana with a vision to serve his people. A full eye clinic was developed in Accra, Ghana’s capital, and it is now an MMI Partner Health Center. Medical Ministry International ships needed equipment and supplies to support “Sight for Africa”. In Ghana, the major causes of avoidable blindness are: Cataract, Glaucoma, Trachoma, Childhood blindness, and Refractive Errors. The objective of the vision program is to perform cataract surgery, provide optometry care, conduct screenings, and to educate patients on being independent without their sight. Outreach programs took place within the Asante Akim North district; the focus of the team was to treat the majority especially the aged who are mostly blinded by cataract. Medical Ministry International has led projects in Breman Asikuma, which is located at the North-Eastern part of the Central Region of Ghana, a two and a half hour drive from Accra. The population of Brema Asikuma is about 12,391 people, and they are mainly farmers. There are few government workers who are predominately teachers and civil servants. There are also a few migrant farmers and workers. The population is mostly indigenous. The project team focuses their efforts throughout 8 villages. Most patients will be women and children with malaria, high blood pressure, diabetes, typhoid, preventative blindness, and some skin diseases. Beginning in 2012, Medical Ministry International provided OB-GYN care at Barnor Hospital in Accra. In March 2016, our team operated on women suffering with uterine fibroids. There were almost 10 patients involved in the successful surgeries. Accra is the capital city of Ghana with a population of about 2,000,000 people. English is the official language of Ghana and is universally used in schools in addition to nine other local languages. The most widely spoken local languages are Ga, Dagomba, Akan and Ewe. Traditional religions accounts for two-fifths of the population. * Project Description: The medical and surgical teams serve at a local Hospital. The patients are pre-screened by our local partners and will come from neighboring villages. Vision Care is also an important part of these project and the teams distribute reading glasses to the patients on an outreach program. The climate in Ghana is tropical. The weather will be hot and humid. Darkuman Kokompe is located outside of Accra, which is the capital of Ghana on the Atlantic coast of West Africa. In Ghana, the major causes of avoidable blindness are: Cataract, Glaucoma, Trachoma, Childhood blindness, Refractive Errors and Others. It is estimated that 80% of the causes are preventable and unfortunately Cataract accounts for almost 45-50% of the causes from Ghana health news. * Project Description: These projects seek to help people people within the Darkuman community. Many people from this community are economically poor and have limited access to health care services. The climate is tropical savanna. The weather will be hot and humid. The average annual rainfall is about 730 mm, which falls primarily during Ghana's two rainy seasons. The chief rainy season begins in April and ends in mid-July, whilst a weaker second rainy season occurs in October. Lartebiokorshie is located in Greater Accra, which is the capital of Ghana on the Atlantic coast of West Africa. * Project Description: These projects seek to help people people within the Lartebiokorshie community. Many people from this community are economically poor and have limited access to health care services. Travelers must present a passport, which must be valid for at least six months beyond the date of expected departure. Tourist visa is required. You must carry proof of yellow fever vaccination. • The visa application may require a letter from your hotel confirming your reservation. - The Medical and Dental Council in Ghana requires all Medical Professionals to register in country prior to the start of the project. The cost is approximately $600(USD) and will be confirmed by MMI Canada office upon receipt of your project application. Medical Professionals that already have a temporary license in Ghana will need to renew their license for a fee of $100(USD). Cost to be verified. - Medical personnel should carry a photocopy or wallet-sized copy of your license to practice medicine as you travel. This will help facilitate customs procedures if you are bringing medicines, instruments or other supplies. The registration approval from the Medical and Dental Council of Ghana or the Nurses Council of Ghana will be provided to you at the project. The Ghana Cedis (GHS) is the currency. MMI staff will help you exchange money once you arrive. Bring US bills over $50.00 in good condition (new and clean with no marks or tears). Bills less than $50.00 are exchanged for a small rate. Traveler’s checks are not easily cashed. $100 bills older than 2006 are also not accepted. Ghana, officially the Republic of Ghana, is a unitary presidential constitutional democracy, located along the Gulf of Guinea and Atlantic Ocean, in the subregion of West Africa. Known for its gold in colonial times, Ghana remains one of the world’s top gold producers and is also noted for their timber, diamonds, cocoa, pineapple, bauxite, and manganese production. The economy continues to rely heavily on agriculture which accounts for 35% of GDP and provides employment for 60% of the work force. Ghana is a conservative and deeply religious country. Although modern attitudes prevail, respect is shown for traditional values and morals. However, the pace of life is not conservative. Ghanaian culture is characterized by a bustle and vibe of social gatherings, which is always colourful and often musical. The celebration of festivals is an essential part of life, whether for child-birth, rites of passage, puberty, marriage, or death.